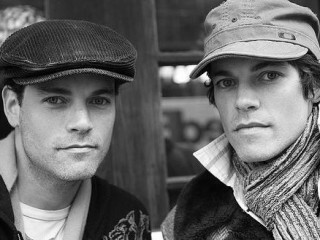 Birthplace : Tucker, Georgia, U.S.
Evan Mitchell Lowenstein and Jaron David Lowenstein (born March 18, 1974) are American musicians and identical twin brothers who performed as Evan and Jaron. Evan and Jaron have recorded three studio albums and charted three singles on the Pop Songs charts. The duo's highest-peaking single is "Crazy for This Girl," which peaked at #15 on the Billboard Hot 100 in 2000. Identical twin brothers Evan and Jaron Lowenstein have attracted popular and critical attention since the middle and late 1990s for their well-crafted popular songs and vocal harmonies, as well as for their adherence to their Orthodox Jewish faith. Their observance of Jewish tradition has prevented them from performing on the Jewish Sabbath--from sundown on Friday to sundown on Saturday--as well as on such religious holidays as Yom Kippur and Rosh Hashanah. This diligence resulted in their rejection of an offer to open for British band Oasis on Rosh Hashanah in 1996 as well as opting out of a 2001 tour with Stevie Nicks, performances that could have brought them tremendous exposure to wider audiences. The brothers ensure that their recording and performing contracts acknowledge their religious faith, specifying that they will not perform on the Sabbath or holidays and that they must be served kosher food while touring. The brothers' music exhibits influences from Elvis Costello, Bruce Springsteen, the Beatles, and the Beach Boys, relying on the strength of Jaron Lowenstein's guitar playing and the duo's vocal harmonies. In March 2006, the pair appeared on ABC's reality TV show, American Inventor, showcasing their Pit Port, a container for discarded seeds and pits in various fruits and nuts. Jaron released a solo single, "Pray for You", credited to Jaron and the Long Road to Love, to country radio in November 2009. The song reached the top 20 on the Hot Country Songs charts, and the top 40 of the Hot 100. Jaron released his debut album, Getting Dressed in the Dark, on June 22, 2010. The album debuted at #2 on the Billboard Top Country Albums chart selling 23,916 copies in its first week. View the full website biography of Evan And Jaron.